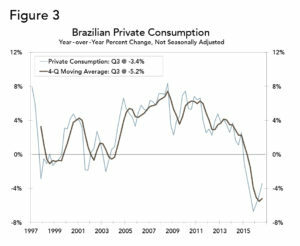 Brazil: Worst Recession in History Not Over | CALÍBAR el rastreador The Brazilian economy remains mired in a deep and long-running recession that continues to threaten all the advances made during the first decade of this century. Back then, the economy benefited from a very strong global growth, export and commodity price environment. Today, none of this is available, and the country has to dig deep in order to figure out how to grow the economy in such a different economic environment. Meanwhile, the political environment is still adjusting from the impeachment process against ex-president Dilma Rousseff. Furthermore, corruption accusations, some old and some new, continue to threaten the stability of the new Temer administration as it tries to right the economy by taking a hard stance on the fiscal deficit. Under this environment, the Brazilian central bank has been called into action to lower interest rates in an attempt to revive economic activity. 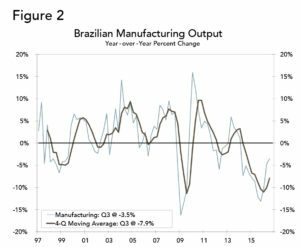 The Brazilian economy remains mired in a deep and long-running recession that continues to threaten all the advances made during the first decade of this century. Back then, the economy benefited from a very strong global growth, export and commodity price environment. Today, none of this is available, and the country has to dig deep in order to figure out how to grow the economy in such a different economic environment. Meanwhile, the political environment is still adjusting from the impeachment process against ex-president Dilma Rousseff. Furthermore, corruption accusations, some old and some new, continue to threaten the stability of the new Temer administration as it tries to right the economy by taking a hard stance on the fiscal deficit. Under this environment, the Brazilian central bank has been called into action to lower interest rates in an attempt to revive economic activity. Although the central bank has started to lower interest rates once again, the path forward is not only difficult domestically but also faces an international environment where the U.S. Federal Reserve is expected to raise interest rates. 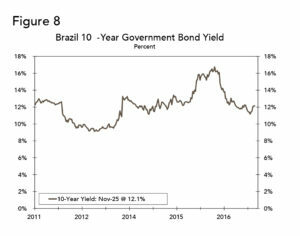 Thus, the effectiveness of Brazilian monetary policy will remain limited, especially if the Temer administration is not successful in putting a lid on fiscal expenditures and the fiscal deficit. The good news is that the deficit has started to come down and the administration seems to be on its way to passing a constitutional amendment that would tie the growth in fiscal expenditures to the rate of inflation for 20 years in an attempt to convince domestic as well as international financial markets of its commitment to fixing the country’s fiscal malaise. 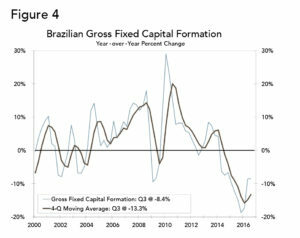 The Brazilian economy remained in a deep recession during the third quarter, justifying recent analysts’ fears that the economy may only grow less than 1 percent in real terms in 2017, while almost discounting a rapid recovery as many had expected after the end of the impeachment process against ex-president Dilma Rousseff earlier this year. However, before Brazilian policymakers try to predict out how little the economy is going to grow next year, they will have to figure out how the economy is going to get out of what is, today, the longest standing recession in the country’s recorded history. According to the Brazilian statistical institute, the economy dropped 0.8 percent in Q3, quarter over quarter, less worse than the 0.9 percent decline markets were expecting. This was the seventh consecutive quarter-over-quarter decline in economic activity and represented further deterioration, compared to the upwardly revised 0.4 percent decline recorded during Q2 2016. Still, this deterioration was expected due to the effects of the Olympic Games, which occurred during the third quarter of the year. Thus, our expectation was already for a very weak performance during the quarter. Compared to the third quarter of last year, the economy was down 2.9 percent and was also better than the consensus expected decline of 3.2 percent during the quarter. However, the year-over-year number has similar issues regarding the Olympics, discussed above, even though the effects of the Olympics may have been relatively small. Perhaps the most positive news from this release was that the economy dropped 4.4 percent during the last fourth quarter, compared to a decline of 4.8 percent during the four previous quarters, which is the first improvement since the recession started in Q1 2015. From the output side of GDP, the country’s transportation sector was the worst performer on a quarter-over-quarter basis, declining 2.6 percent, followed by the all-important manufacturing sector, which declined 2.1 percent. Meanwhile, the construction sector dropped another 1.7 percent while the agricultural sector dropped 1.4 percent. Other services output was down 1.0 percent. Sectors that declined less than overall GDP were financial activities, down 0.6 percent, commerce, down 0.5 percent, public utilities, down 0.2 percent, and public administration and education, down 0.1 percent. The only sectors that posted a quarter-over-quarter improvement were information services, up 0.5 percent and a very strong improvement for the mining sector, up 3.8 percent. On a year-over-year basis, and still from the production side of the economy, the picture is not much better. The transportation sector was also the weakest sector of the economy on a year-earlier basis, plunging 7.4 percent with agriculture output declining 6.0 percent and construction down 4.9 percent. Meanwhile, commerce was down 4.4 percent, manufacturing was down 3.5 percent and the financial services sector was down 3.3 percent. Output of other services, information services and mining output were down 2.5 percent, 1.5 percent and 1.3 percent, respectively. The only sectors that contributed to GDP growth from the output side were public administration and public education, up 0.1 percent, real estate activities, also up 0.1 percent, and the public utilities sectors, which posted a year-earlier growth rate of 4.3 percent. 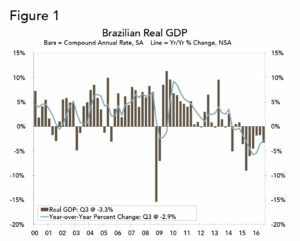 Perhaps the demand side of GDP shows a better picture of the deep recession of the Brazilian economy. From this side of GDP, the only “contributor” to economic growth during the third quarter was a 3.1 quarter-on-quarter collapse of real imports of goods and services (recall that imports enter the GDP calculation with a negative sign). Every other sector subtracted from the economy during the quarter with exports of goods and services declining 2.8 percent, gross fixed investment down 3.1 percent, personal consumption expenditures (PCE) down 0.6 percent and government consumption down 0.3 percent. Recall that imports of goods and services were up 2.8 percent during the second quarter of the year, which helped economic growth considerably, while gross fixed investment was also up 0.5 percent during the quarter. This means that the deterioration of economic performance during the third quarter was more worrisome than meets the eye. A very similar picture can be observed by looking at the year-over-year numbers, with the caveat that the external sector was the only contributing sector that mitigated the blow on economic activity by PCE (-3.4 percent), government expenditures (-0.8 percent) and gross fixed investment, (-8.4 percent) as real exports of goods and services improved 0.2 percent, while real imports of goods and services collapsed 6.8 percent. This means that the external sector continues to be the only sector with a positive contribution to real GDP growth in the Brazilian economy. With An Absentee Fiscal Sector, Is The Central Bank To The Rescue? 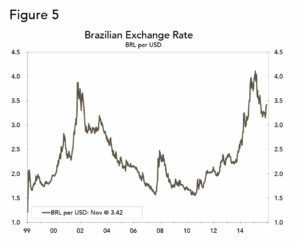 With such dismal economic performance and an almost impossibility to conduct fiscal policy after so many years of fiscal largesse supported by strong commodity prices and an export expansion, the Brazilian central bank seems to have taken the lead in helping the economy out of its worst recession in recorded history. The change started in October when the central bank lowered the Selic benchmark interest rate by 25 basis points to 14.0 percent from 14.25 percent—the first decline since October 2012. The central bank made a second downward move of 25 basis points on Nov. 30, taking it to 13.75 percent as the central bank felt more comfortable regarding the potential path for inflation. Some of this decline in inflation was expected as the country liberalized some of the controlled prices in order to help mitigate the surge in the fiscal deficit that has cost the country its coveted investment grade rating by major risk rating agencies. However, without much help from the fiscal sector, which is still fighting to put a lid on an out of control fiscal deficit, the job for the central bank to help economic activity will be difficult as well as very tricky. Having said this, the central bank has had help from the currency market as the strong nominal depreciation that started at the end of 2014 reversed course during the second quarter of this year, and although the currency saw an sizeable drop in November, the environment for the central bank to reverse its monetary policy stance has improved considerably compared to the last several years. Furthermore, typically, the wholesale price index in Brazil is a leading indicator for the potential path of consumer prices, and that indicator has slowed down considerably over the last several months. 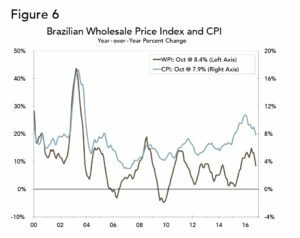 The Brazilian wholesale price index peaked at 14.8 percent in June 2016 and was 8.4 percent in October, year over year (see Figure 6). Thus, the expectation is that there will be reduced pressures on the consumer price index going forward. Furthermore, since some of the controlled prices have already been adjusted, they are not posing a threat for the future, at least from today’s perspective. Perhaps the biggest risk on a higher inflation path could be if the recent spike in oil prices sticks and petroleum price imports are passed by Petrobras, the state-owned monopoly, to gasoline prices. Added to this slowdown in inflation, due to the phase-off of regulated prices, is the fact that the economy is so weak that it is unlikely that demand pressures will help push prices higher in the short to medium term and thus prevent the central bank from lowering, albeit slowly, interest rates. Thus, we believe that, at least for now, the central bank will have some smooth sailing to slowly lower interest rates. What we are not convinced of is how effective monetary policy is going to be in turning around the current recessionary environment, especially if the U.S. Federal Reserve continues to increase interest rates as we expect. Perhaps this is the tricky part we were referring to above, as the institution will have to be very careful to keep a tight balance between opposite monetary policy directions both in the United States and at home. 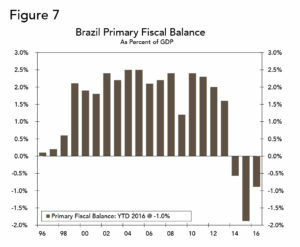 The Brazilian fiscal deficit is still very large but we have started to see some improvements on the primary fiscal side. Case in point was the October primary fiscal result, which does not include the payment of interest on the debt. The October result showed a very large surplus of 39.6 billion reais, driven by a primary surplus from the federal government of 50.6 billion reais. Of course, this is just a one month look at the number and it may be related to some one-off issues, but if we start to see some recurrence of this type of performance from the federal government then it may point to an important turnaround in the fiscal malaise that has cost the country its coveted investment grade ranking. Still, the primary deficit was 0.9 percent of GDP during the January-October period compared to a deficit of 1.9 percent of GDP for the same period a year earlier. Furthermore, the 12-month primary deficit stood at 2.2 percent of GDP compared to 3.1 percent during the previous month. This means that the improvement seen recently has been real. However, its sustainability will probably depend on the recent legislation that is close to passing the country’s legislative hurdles that will tie the increase in government expenditures to the increase in the price level, a sort of “constitutional” spending limit with a proposed time-span of 20 years with the possibility to revise the cap after the first 10 years. According to experts, the new spending cap is expected to pass without much trouble in both chambers of the Brazilian congress even as the measure has been opposed by the Workers Party and other labor and social groups in the country. Meanwhile, the overall fiscal deficit stood at 7.3 percent of GDP, year to date in October, compared to 9.1 percent during the same period a year earlier and compared to a 10.4 percent of GDP for the whole of 2015. Thus, even though it seems that the measures the Temer administration has taken so far are already helping to put a lid on expenditures, the administration wants to pass this new legislation in order to convince the markets that the country is committed to bringing down the deficit and that it is not something temporary. Furthermore, the Temer administration is probably aware of the issues it will confront trying to finance such a high deficit in an international financial environment where the U.S. Federal Reserve is expected to continue to raise interest rates. Brazil is today, once again, between a rock and a hard place. Devoid of the resources that helped the Lula da Silva administration remain one of the most “prosperous” in the country’s history, the Temer administration is trying to redraw the boundaries of what is, and what is not, possible in today’s economic environment. Although the Temer administration has started to produce results from the fiscal side as the fiscal deficit has started to improve, the road ahead remains full of roadblocks. Furthermore, as the Temer administration takes the fiscal alternative off the table, expectations are for monetary policy to do the trick. However, the Brazilian central bank is not the U.S. Federal Reserve, and even the U.S. Federal Reserve has issues with what it has been able to achieve. Thus, the Temer administration has to figure out how to control a government sector that had ran amok and hope for investment to come back and deliver economic growth. Without strong economic growth, fiscal accounts will remain under pressure as social discontent will likely increase. Once economic growth resumes, monetary policy will come back to the forefront as the central bank will have to be very careful that its expansionary monetary policy does not help unsettle inflationary expectations once again. Thus, monetary policy can help during the next year or so but the central bank will have to pick its battles and keep inflationary expectations at bay. 1. Very high interest rates plus a capital repatriation campaign seemed to have helped on this nominal appreciation while it is possible that the decision to cut interest rates in October renewed the pressure on the currency during the month. Las contribuciones de los autores invitados no expresan necesariamente la opinión de Calibar.